CDC has partnered with the US Department of Agriculture (USDA) and 4-H to develop "The Junior Disease Detectives: Operation Outbreak," a graphic novel intended to educate youth audiences about variant flu and the real disease detective work conducted by public and animal health experts when outbreaks of infectious diseases occur. The graphic novel is available for free download in web, home print and professional print versions at www.cdc.gov/flu/graphicnovel. In addition, there are CDC resources available about Swine Influenza/Variant Influenza Virus that include fact sheets and more at https://www.cdc.gov/flu/swineflu/index.htm. We are pleased to accept applications for the 2018 NAAE XLR8 professional development program. The program is sponsored by CSX Transportation as a special project of the National FFA Foundation. XLR8 is a year-long professional development program that targets agriculture teachers in their 7th-15th year of teaching. Click here for more information and to apply by TODAY, August 20th. National Teach Ag Day is just around the corner! Find out how you can participate and celebrate the Best. Career. Ever! All this and more in the August edition of News & Views! Presented by Zoetis, the Veterinarians on Call YouTube channel features real-life vets doing a variety of tasks. This week, Dr. José García-López of Tufts University Hospital for Large Animals outside Boston examines Matador, an injured show horse, who is showing lameness in one leg. Click here to watch the video. 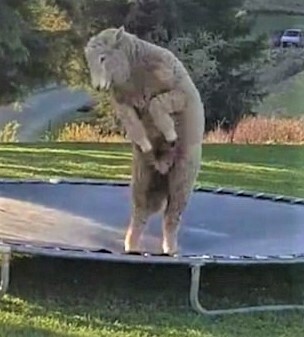 A bouncing sheep finds its inner lamb-like self. Friday, August 17, 2018: Genome editing spurs ag innovations, a glyphosate lawsuit raises issues, and a bouncing sheep finds its inner lamb-like self. These and many more ag/science stories in this week’s edition.